DRESSLER, Virginia A. 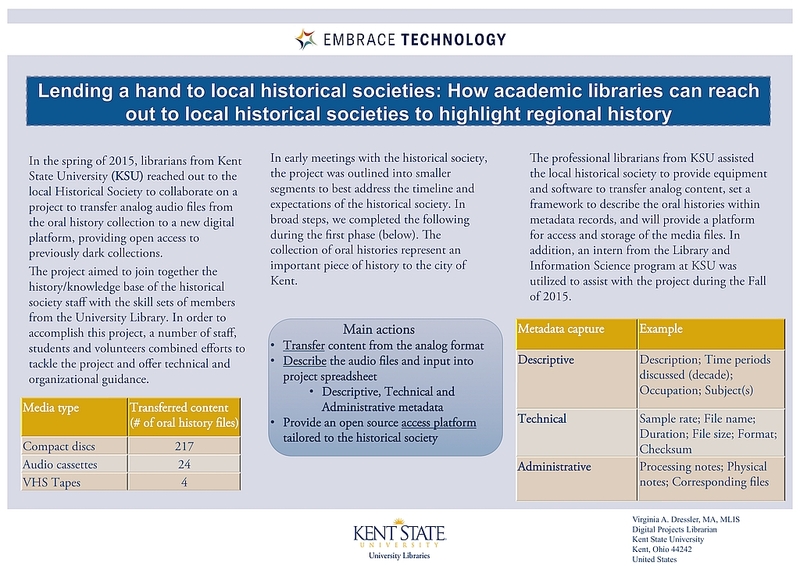 (2016) Lending a hand to local historical societies: How academic libraries can reach out to local historical societies to highlight regional history. Paper presented at: IFLA WLIC 2016 – Columbus, OH – Connections. Collaboration. Community in Session 101 - Poster Sessions. 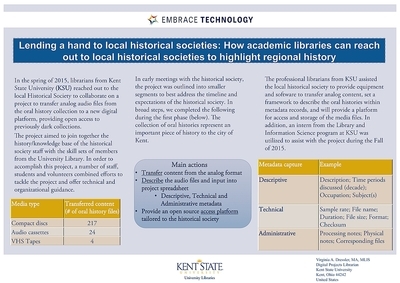 During the Fall of 2015, the Kent State University Library worked with the local Kent Historical Society to create a digital archive of oral histories from their collection. Faculty from the library offered services to assist with workflow in digital media production and metadata decisions to the small, non-profit staff, along with the assistance of an intern from the School of Library and Information Science. Since the Kent State shootings on the campus in May of 1970, there has been a divide between the campus and the town, a divide that has been slowly healing for forty-five years. One hope with the project is to continue the healing with a collaborative project focused on regional history (including the town response to the shootings), and lending specialized skill sets to assist with a digital initiatives project. An additional goal of the project is the creation of a metadata template for oral histories and a workflow for transferring audio content, which is available for other institutions to freely use. This poster will highlight the workflows and provide examples of the final project, as well as feature a new tool developed by a faculty member in an open source audio-to-text transcription application.